In those Catholic parishes that have an active RCIA program, these readings to which we just listened – including the long Gospel story from John about the Man Born Blind – are read not just every third year in the Church’s 3-year Sunday cycle, but they are read every year on the Fourth Sunday of Lent. It’s during the Lenten Season when the Rite of Christian Initiation of Adults – reclaiming the Church’s ancient practice of welcoming new members through a very thoughtful and prayerful process of initiation – welcomes adults who have been preparing for many months, sometimes years, to become Christian through the Easter Waters of Baptism. Most of us, probably, have a sense of what values are, let alone what values might be true or false, or perhaps what values appear true, but, when brought into the light of faith, are seen for what they truly are. I had an experience recently that made me wonder how common such an understanding is. Recently I had the occasion to speak with someone and I asked this person what values he was handing on to his children by certain actions he was engaging in. I almost was caught off guard when the response came, “what do you mean by values?” I tried to find a way to say what I meant, to get him to think of what is important in his life, what he finds to be of worth and lasting significance. He was able to say “family” was important to him – but knowing a bit about his family – I pressed further. “What about ‘family’ is valuable and important?” After all, I thought – even Vito Corleone or his real life counterparts in the contemporary Mafia – a crime organization whose members Pope Francis forcefully addressed this past week – would also have expressed belief in “family,” wouldn’t they? And, in our own country and culture wars, how often do we see bumper stickers promoting “family values” by those whose life choices make one ask whether Jesus would have chosen similarly. When we listen to today’s readings, it doesn’t take a degree in theology to understand what their real meaning is all about. 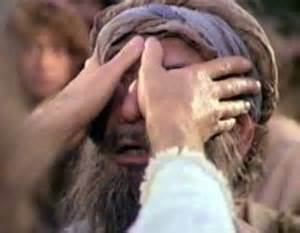 As we listen to this story of the man who, blind from birth, is given physical sight by Jesus’ actions, we also know that those religious leaders of the day, gifted with physical sight like most of humanity, have become blind to what is truly important, what is truly real, what is truly good, what is truly of value. Through the false values they have subscribed to, they seem chained to a rigid understanding of human rules and laws and regulations, for the Gospel writer tells us they cannot see what is plainly in front of them. Not only do they fail to stand back in awe and in wonder at the miracle of healing that Jesus has brought about, more importantly they fail to see who Jesus is. Blinded as they are by pride, power and position, they fail to see the identity of this miracle worker from Nazareth, the one who not only demonstrates power now over human ailments, but who soon will be shown as the One Who has power of death itself. How often do we, too – or religious leaders in our own day – succumb to the same temptation? How often do we fail to recognize the Hand of God at work in the world simply because what we see does not fit with our preconceived notions of what is good and right? How often are we blind to the face of God in other people – either in our own backyard or across the globe – simply because they do not look like us or have lives which have traveled a different path? Do we have eyes to see that we are created in the Image of God, or do we prefer to limit our vision to a god created in the image of ourselves? As we move toward the end of our Lenten journey, what still blinds us to seeing, like God, into not only the hearts of others, but into our own hearts? Let us pray that, as our gathering song prays, our eyes might be opened to see the face of God in everyone, our ears might be opened to hear the voice of God in the cries of God’s people, and that our hearts might be opened to love one another as God loves us. This entry was posted in Homilies and tagged blindness, Lent, Man Born Blind, RCIA, Scrutinies, spiritual blindness, values. Bookmark the permalink.